As studies on migration, Diaspora, citizenship are increasing in numbers, one trend that is mostly observed and hence has been the subject of numerous researches is the phenomenon of marrying back home; where many young people tend to get spouses from their ancestral land. 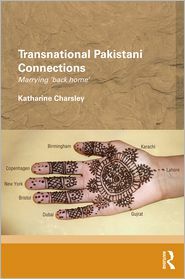 While many researches on this subject have highlighted the strategic motivations for such acts; Katherine Charsley’s book stands out as it engages in the notion of emotion encompassing such transnational marriages without narrowing the causes down to just power and strategy. In ‘marrying back home’, she observes this transnational marriage practice found among the Pakistani Diaspora residing in Bristol, Western England. This work is based on ethnographic research done in Pakistan Punjab and Bristol in two phases, 2000-01 and 2007-08. The introduction of the book is highly enlightening. It provides a precise yet detailed history of the Pakistani migration to UK, while also highlighting many changes in the migration policies in both Pakistan and Europe, mainly UK. She then moves forward to provide a small background idea of the Bristol Pakistanis, throwing some light upon their heterogeneity in terms of class and urban-rural divide and demography. This chapter also entails her fieldwork experience and the problems she faced during the time of her fieldwork. The first chapter brings forth various rituals involved in a Pakistani marriage. This, she writes based on her ethnography in Pakistan. The various rituals involved in a wedding like mehndi, nikah-namma, rukshati, walima, etc. She writes that wedding styles can also differ based on socio-economic status, participant’s place of origin and also by technological advances. While she classifies wedding styles into- religious, traditional and modern; the reader gets confused as she hardly brings the distinction between religious and traditional to the front properly. The second chapter offers a detailed review of transnationalism literature and tries to place this particular ethnography within the broader frame. Here, she highlights the difference in language and culture between the two places- Pakistan, Bristol which forces code-switching, behaviour that is suitable for a particular place. For instance, Bristish Paksitanis have to wear particular kind of clothes, speak proper Urdu while in Pakistan while such behaviours aren’t necessary in Bristol. Thus, they negotiate with their identities while in Pakistan. Similarly she also observes British Pakistanis children lack power and have little control over their lives while in Pakistan. Thus, she argues that both identity and power are negotiated transnationally. Weddings, undoubtedly involve finding a proper spouse. In the third chapter, the author highlights this aspect through ‘rishta’. Here, she argues rishta is not only proposal but it also means a match and sometimes, connection. Thus, the word rishta encompasses numerous meanings which vary according to the context. This chapter examines the desired characteristics of a life partner and how these partners are searched. A good rishta not only involves details about family background, educational levels, aspirations, etc but also involves emotional satisfaction and attraction. Hence, the author argues that spouse selection involves an inter-play of both strategy and emotions. Marriage, involves risk, the risk of being ill-treated. In chapter four, the author analyses the marriage preference of involved community through the perspective of risk. People prefer to marry their close kin even settled transnationally not because of strategic motivations regarding family assets but because such choices tone down the element of risk involved in marriages, reducing the risk of ill treatment of mainly young women as they are in the households of known kin. This idea of risk is furthered in the next chapter, which highlights a particular aspect of the British Pakistani marriage i.e. the gap between the nikah and rukshati ritual. Rukshati implies the departure of the daughter and the consummation of marriage. Such an act is a strategy taken to minimise the risk, the author contends. Since transnational marriages involve legal pluralism, these tactics help British Pakistani women from many risks like polygamy, marriage for economic gain, etc. The use of accounts from the respondents in this particular chapter helps to understand such risks. the author notices that Islam uses the institution of ‘mahr’ as a way of protecting women in marriage; however based on her ethnography she could also document how such practices seem to be inadequate in real life. While certain marriages are preferred for the addressing risks, sometimes marriage within a kin group (baradari) entails its own problems. Since the kin-group operates within ideas of honour (izzat, in the book); a failed marriage brings up clashes within the group highlighting the importance of honour. A powerful narrative by one of the respondents, Yashmin has been used by the author to highlight such complications in web of relationships in the sixth chapter. The failed marriage of Yashmin and her father’s efforts in helping her daughter is seen as disrespectful thereby hampering the honour of the whole kin-group, for which they had to face many difficulties. This chapter has enabling explanations of the notion of honour and in the end provides thought provoking argument about the inter-play of emotions and honour, honour being invoked due to heightened emotional experience. The next chapter is about the men that migrate to Bristol after marriage, often called as ghar-damad. The author in this chapter explores various issues that these men face like being in a new environment with little or no occupational skills, experience downward mobility, often face work-life conflicts and most important find their masculinity threatened. Having to leave his natal place after marriage goes against the patriarchal rules, the man or the ‘imported husband’ hence finds the gendered configuration upside down. Such men are often ridiculed at and seen as incapable of leading family life. Such experiences can be partly seen as the reason for failure of transnational marriages, the author argues. However not all ‘imported men’ experience such problems; there are few positive experiences as well. In the end of the chapter, the author again brings into light complex meanings involved in the notions of izzat. While often seen as honour, this chapter also sees it as personal morality. The last chapter represents the conclusion for the whole book. In a concise manner, this chapter shows how emotions are involved in transnational marriage and how it differs by gender. It finally describes how her work balances the picture in an increasingly academic field that emphasizes strategic motivations for transnational marriage. Charsley’s work offers quality research into the areas of kinship, migration and transnationalism. Focusing on emotions provides a new twist to these studies. Her most commendable effort is not to see things as binary opposites, rather to perceive them as dynamics which are subject to change in different context, like rishta and izzat. The particular study can be seen as interlinking many aspects of sociology- kinship, sociology of emotions, power and control, gender, etc. This work emerges as a successful effort in highlighting the interpretive orientation of the social world. A comparative perspective about communities that don’t prefer marriages within kin-group can further enrich research on emotions in mediating transnational marriages. Charsley, Katherine. Transnational Pakistani Connections :marrying 'back home'. New York: Routledge, 2013.